Our unbeatable location means guests can go straight from the hotel to the chairlift with their ski boots already on. The Tuc Blanc is located at the foot of the ski slopes in Baqueira Beret, at the so-called Level 1500, next to the ski lift. It is in the spectacular Arán Valley, just 14 km from the town of Vielha. Our guides will show you the best of the ski slopes and our entertainments team will make your skiing holiday all the more enjoyable for both you and your kids. And the icing on the cake is our gastronomic offer, as our restaurants and tapas bar are among the best in the 1500 Zone. Our comfortable bar serves tapas, brochettes and other dishes on its terrace with panoramic views and our magnificent restaurant invites you to try the best dishes from the Aran Valley. And if that’s not enough, every Tuesday we lay on a Tapas Bus to take you on a tour of the best places to try these delicious snacks in Vielha. Forget your car, we provide the transport! These are just some of the advantages of staying at the Hotel Tuc Blanc! 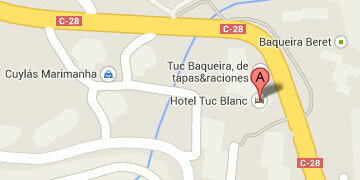 The Tuc Blanc is also a family hotel. We offer special rates and large, comfortable rooms ideal for enjoying with the whole family. Our special children’s services and activities mean both you and your kids will have the greatest time. The Tuc Blanc is located at the foot of the ski slopes in Baqueira Beret, at the so-called Level 1500, next to the ski lift. From Monday to Friday between 10 am and 1 pm the hotel offers a free public relations service on the ski slopes to help you get the most out of your day’s skiing. We also offer free activities for children from Monday to Saturday between 4 and 8 pm. Other hotel facilities include a covered swimming pool, sauna, jacuzzi with panoramic views and a hairdresser. In addition to our comfortable rooms, Tuc Blanc offers a wide range of services designed to give you the best ever holidays in the snow! We offer beauty treatments and physiotherapy, as well as a wide variety of activities to enjoy the unique and exceptional setting of the Aran Valley. If after a long day of skiing you feel like “eating a horse”, don’t miss our gastronomic offer: a variety of brochettes, delicious tapas, our super XXL hamburger or the magnificent menu of our à la carte restaurant. And to round off a perfect meal, go out onto our panoramic terrace, order yourself a fruit cocktail and settle back to enjoy the sunset.